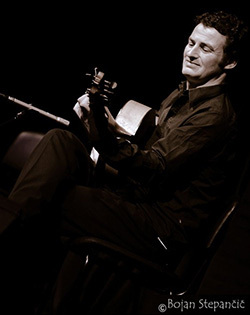 The Flamenco guitarist Alexander Gavilán mixes an orthodox technique with modern, usually own compositions. His playing is intense and virtuosic. He is a skilled dance and vocal accompanist and sometimes also performs solo. Although he is more at home within the traditional Flamenco , where he frequently works with dancers Irene Alvarez and Federico Ordoñez and the singers Carmen Fernandez, Jose Ligero, Ana Gomez and José Parrondo, he also enjoys participating in musical experiments such as for instance with the group "A touch of Flamenco" by drummer Klaus Mages or the "Music Ensemble of Benares" (Kathak / Flamenco). Alexander Gavilán studied Flamenco guitar at Codarts Rotterdam with Paco Peña, Ricardo Mendeville and Hans van Goch. In Seville, he took classes with Niño de Pura, M.A. Cortes and J.L. Postigo. he also attended master classes with Manolo Franco, Tomatito, Paco Serrano, Moraíto, Alfredo Lagos, Chicuelo and Diego de Morao. Since 1994, Alexander Gavilán starred with various ensembles (including "Amanecer," "A Touch of Flamenco", "DOS", "Trio Federico Ordoñez") on numerous European stages as a guest. Among others he performed in: Philharmonie Krakow, Poland, Flamenco Festivals Düsseldorf and Freiburg, Germany, Concertgebouw Amsterdam, Royal Circus in Brussels, Festival of Music of the 21st century in Evora, Portugal, Guitar Festival Balatonfüred, Hungary, Flamenco Festival Rotterdam, Gypsy Festival Tilburg, Slovenian International Flamenco Festival (SIFF) and Festival Ibérica, Czech Republic. In 2007 he produced the show "Pastora", a tribute to the singer Niña de los Peines (Zuiderpershuis Antwerp) and in 2008 "12 Tiempos de Amor" for OdeGand, Festival of Flanders. Since 2005 he combines his performances with an appointment as a lecturer in Flamenco guitar at Codarts Rotterdam. His latest projects are "The Alegrias y Soledad" (2010) and "Zarzamora" (2011) with the "Cuadro Flamenco Irene Alvarez".